In the tattoos community there are a lot of black skin people (as you know, the white skin guys are not the only one that get tattoos 🙂 ) and as everybody else when dark skinned people seek for something unique and special to tattoo on their body, many times they stumble upon the idea to make white ink tattoo design. White tattooing is a statement without being too loud. People with white ink tattoos can make their mark but still stand out from the crowd. While white ink art have many advantages they are not without disadvantages. If done in a poor or slapdash manner they can look really bad and leave unsightly marks for the rest of their lives. You need to pick out an artist who specializes in this. Fortunately, most of professional tattoo artists can handle white tattoo without a problem exactly in the same way as other tattoos they are doing. 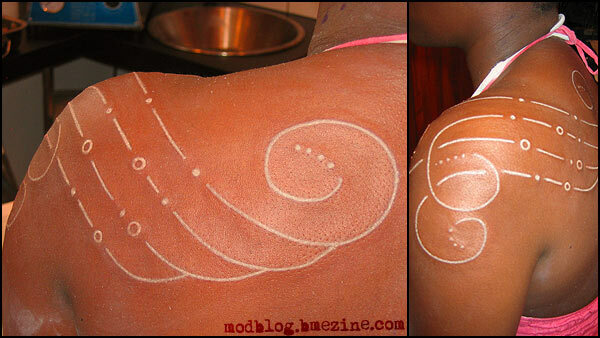 And now, after this short introduction, i want to talk about white ink tattoos on black people. Many professional tattoo artists and customers that tried to do that, recommend to avoid applying white ink on dark skin and suggest to use it on more lighter and pale body complexions (read more about white tattoo on pale skin here). But still, there is a lot of evidence and recommendation of many black people (especially the African American guys i used to talk to) that really like how the white tattoo worked out for them. They say that the white ink really pops and stand out on their darker skin especially if more touched up applied on the white tattoo after it get healed. It’s important to point out that the result will really depend on how your dark skin complexion is in the first place and the artist experience. Don’t forget, that the tattoo ink is applied under the skin, and the skin color itself can really change the tone of the tattoo – just imagine looking on white paper using dark sunglasses, it’s the same. And like it was mentioned before, if you go back to the studio and touch-up the tattoo a few additional times, it will really help it’s shape and style. About tattoo protection from sun damage- sunblock should be used on the white ink tattoo as it tends to fade more quicker that other tattoos. Also, if you can, choose place that is not exposed directly to the sun such as you back, chest on the inner part of you hand, at least in the first period after you done your tattoo. In addition, there is great difference between high quality tattoo ink and the more cheap one, be sure to check and ask the tattoo artist what kind of ink he use and f the answers sounds strange and shady – go to another artist. To summarize this, usually we don’t recommend to get white tattoo on dark skin, but eventually, it’s a matter of taste and no one can really say the white ink tattoos on black people – it’s bad, as it’s just a personal view on a subject. In many occasions those tattoo turned out really great! So, it’s up to you. There a bunch of different designs, wings tattoos, males, Chinese art, tribal tattoos, tattoos for sisters and etc. Just pick the one you love the most. Regarding the tattoo design considerations – there is no really differences between the white tattoos designs to the classical ones. Choose the design you like and feel connected with or draw your own (or ask a friend) and go for it. I recommend you to check the 3,000+ tattoo designs collection sets such as this. Inside, there are something for everyone, and investing couple of bucks to get the tattoo design you dream of sound like a great deal to me. The Mammoth Book of Tattoos – tattoo design collection that covers all styles of tattoos from bold tribal pieces, Chines characters, and hieroglyphs to delicate air-brushed designs. Included are striking images of tattoos ranging from all-over “body suits” to individual motifs. 512 pages of amazing tattoo ideas and inspiration! Another tattoo book recommendation, is the Great Book of Tattoo Designs. It’s a comprehensive collection of original artwork presents all of today’s most popular tattoo subjects range from delicate roses to majestic animals, from steampunk to Celtic tattoo designs, from fairies to Mayan warriors tattoos and much more. If you’re inspired to make a permanent personal statement with artwork that is truly artwork, these tattoo-friendly designs are just what you’re looking for. With over 500 images here to choose from, the Great Book of Tattoo Designs is a great source for tattoo inspiration for you. For even more inspiration, check out The World Atlas of Tattoos, highly recommended tattoo design book that will provide you with tons of ideas. It’s a 400 pages illustrated global exploration of the vast array of styles and most significant practitioners of tattoo from ancient times to today with over 700 stunning color illustrations of tattoo practices in Europe, the Americas, the Middle East, North and Sub-Saharan Africa, Asia, Australia, and the Pacific Islands. Each section in the book, dedicated to a specific geographic region, features fascinating text by tattoo experts that explores the history and traditions native to that area as well as current styles and trends. The World Atlas of Tattoo also tracks the movement of styles from their indigenous settings to diasporic communities, where they have often been transformed into creative, multicultural, hybrid designs. The work of 100 notable artists from around the globe is showcased in this definitive reference on a widespread and intriguing art practice. 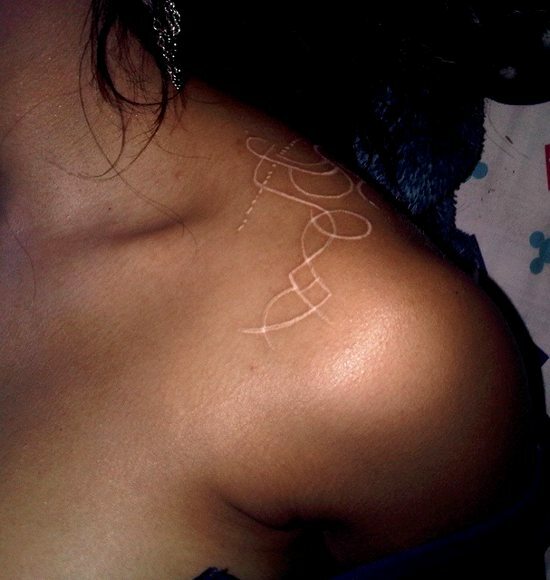 White tattoo, to get or not to get? Like with every other tattoo. If you have black skin and you consider doing white tattoo, all the rules applied here are as for any other tattooing process – pick sterile and clean place, choose recommended tattoo artist that use quality brands and got history of great tattoo works and designs (and don’t hesitate to to ask for his tattoo art and sketches). Always remember to threat you tattoo right and use skin and sun care. Protect the tattoo from direct exposure to the sun and don’t forget to do touch ups is needed. Please leave comment for any question or suggestion that you may have, we will be happy to assist.